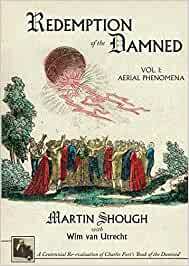 Charles Fort published his first and most influential book, The Book of the Damned, a century ago in 1919, collecting together many historical reports of strange aerial phenomena. Since the birth of the UFO controversy in 1947 Fort's writings have been cited in countless books and web pages. Yet this is the first time in a hundred years that researchers have systematically verified the sources and content of every one of these oft-recycled stories, correcting many errors, placing each case in its historical context, and submitting it to a careful scientific investigation in an attempt to find a conventional answer. What were these reported phenomena? Is it possible to find non-exotic explanations? With the advantage of modern knowledge, methods, and resources, in most cases the answer proves to be yes. Some of the solutions found may shock the general reader and surprise even specialists. Yet, in the end, a few well-documented events remain unexplained. This is a huge (410 page), large format (8.27 × 11.69 inch), full-color book with more than 250 illustrations! MARTIN SHOUGH is author or co-author of various books, papers, and reports, and has been involved in a number of notable investigations. He is a Research Associate for the National Aviation Reporting Center on Anomalous Phenomena (NARCAP) and is the author of several NARCAP Technical Reports. He has contributed to the book UFOs: 1947-1987 (Fortean Tomes, 1987) and the monograph Report on Aerial Phenomena Observed Near the Channel Islands, UK, on April 23, 2007 (UPIAR, Torino, 2008 ), co-authored Return to Magonia (Anomalist Books 2015), and authored Truant Boy: Art, Authenticity & Paul McCartney (Monymusk Media, 2017). He has also published in the Journal of Scientific Exploration, Magonia, and Darklore. He has been a photolithographer, semi-professional musician, artist and gallery owner. He lives in the north of Scotland. WIM VAN UTRECHT dates his interest in unusual sky phenomena back to 1974. In 1994 he initiated CAELESTIA, a research initiative that seeks to fi nd explanations rather than promote mysteries. In 2007, together with Frederick Delaere, he set up the Belgisch UFO-meldpunt to monitor UFO reports in Belgium. He is co-author of two books: Unidentified Aerial Object Photographed near Zwischbergen, Switzerland, on July 26, 1975 (CAELESTIA, 1995, with Frits van der Veldt) and Belgium in UFO Photographs - Volume 1 (UPIAR, 2018, with Vicente-Juan Ballester Olmos). His interests include photography and eccentric meteorological phenomena.